SWeet dreams are made of Freeze. Pressed Juicery’s juice-based Freeze is maybe the greatest thing to happen to juicing since the beginning of the cold-pressed revolution. It’s nutrient-dense, vegan, and made in small batches like the rest of Pressed’s lineup – except it’s not bottled. It’s soft-serve. 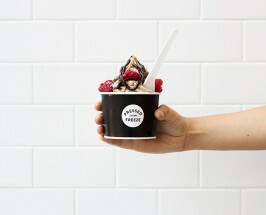 We’ve long been fans of The Chalkboard, but recently we took our love to the next level when they sent us to try Pressed Juicery Freeze, the perfect summer treat. Made only from roots, fruits and vegetables, everyone on our team was immediately hooked, seriously doubting how something this good for you could taste, well, good. I got half greens, half vanilla. I wanted something juice centered since it felt unique to have a juice in fro-yo form, but I also wanted a sweet/a nice base of flavor (via the vanilla). I added hemp and chia seeds with honey since I wanted some crunch and a power boost of good-for-you-seeds. Raspberries are just a plus of color. I literally have deep hopes of eating this every day. It was fresh, filling, and overall likely preferred over most of the normal sweets I eat. I got the greens flavor because that might be the only way I will get a serving of greens… disguise it as ice cream and I will eat almost anything! Then, I topped mine with three kinds of fruit because it was so hot outside. My mixture was refreshing and absolutely delicious. I’m never eating salad again, only green freeze! I love anything nutty and am a granola-girl at heart, so I had to get the vanilla with the peanut butter drizzle. As an extra treat, I topped mine with honey, hemp seeds and Hawaiian sea salt for that perfect blend of salty and sweet. I ordered a half greens, half fruits freeze. I almost ordered chocolate and vanilla since they are my go to froyo flavors, but after trying the green and fruit, I was so impressed — they taste like popsicles! 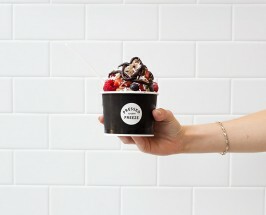 I can’t think of a froyo that is not dressed with some kind of colorful fresh toppings, so raspberries, blueberries and strawberries were a must, along with coconut flakes and chocolate drizzle on top! I haven’t seen sunflower seeds offered as a topping before, so had to try that one as well. Healthy and delicious at the same time. I am a big froyo fan so it’s great to know that there is a diary-free option for the diary-shy folks like me this summer! 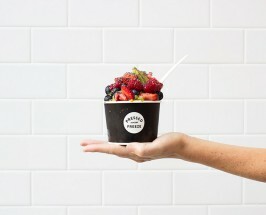 Secretly wishing Pressed Juicery opened a location next door to our office. Vanilla freeze with almond butter, cacao nut freezing drizzle, Hawaiian pink salt and a few raspberries. I’m someone who likes to stick to the basics. I’m obsessed with chocolate and I am such a fan of salty and sweet, so I took that approach when choosing what to order. Of course, I loved it. 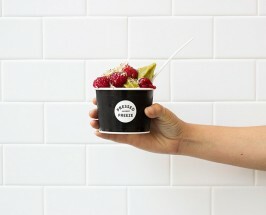 Share the post "TCM Editor Obsessions: 5 Ways To Eat Pressed Juicery’s Freeze"
Sounds amazing! So wish you had a location in Las Vegas!